In September, a group of our community’s leaders walked the streets of downtown Bend learning how their engagement within the community, like those before them, would form the future of Central Oregon. As part of Leadership Bend (LB), the class would, over the next nine months, learn about the keystones that are foundations of Central Oregon communities. They participated in sessions on topics including local government, economy and tourism, culture, education, and natural resources. Along with monthly sessions, homework, and attending numerous community events including city club luncheons, EDCO talks, and city council meetings, the class also put on the Leadership Bend Impact Summit (LBIS). This phenomenal event was the classes legacy project. It was an experience from which all who participated walked away with a sense of pride and inspiration. The final session of the class on May 17, focused on the natural resources of Central Oregon. It was an incredible finale to the program. Guest educators discussed the importance of water to the region and the beauty of local landscapes. The class went away with an appreciation for their environment and inspired to explore the natural beauty of Oregon. Figure 2 – Brent Fenty of Oregon Natural Desert Association talks about local environment. On May 22, the 25th LB class graduated in the capstone of an exceptional program. The night also celebrated LB’s 25th year with the unveiling of a new logo. Speakers included former class participants, LB title investor and fellow alum Todd Taylor, and LB program founder Connie Worrell Druliner. It was an incredible night that offered each member of the 2018 class an opportunity to share what they were taking away. 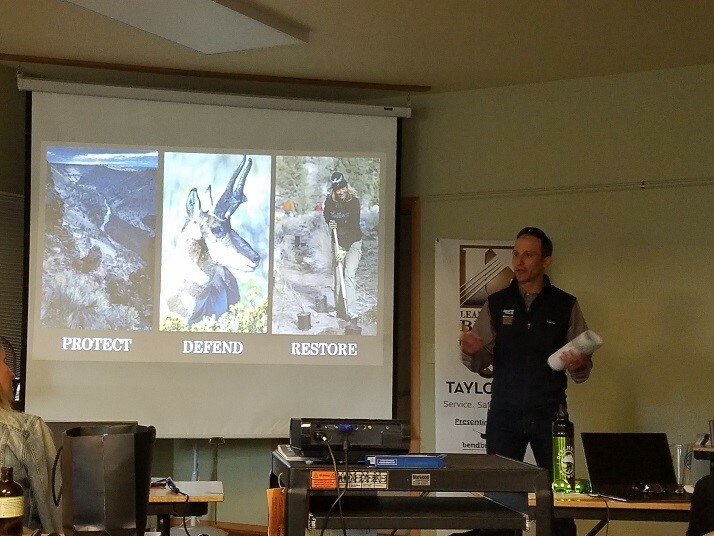 From their experiences, team accomplishments, and passionate resolve they will take their next steps empowered to form Central Oregon’s future and lead others to do the same. The LB Class of 2018 class wishes to thank all the guest educators for their wonderful instruction, the alumni of LB for creating a program that has endured 25 years, the Chamber for its sponsorship, and Jamie Christman for her tireless dedication to making the program a success. Thank you. Tom Headley Century West Engineering Corp.
Melissa Woepse Kollective Technology Inc. This entry was written by Garrett Jaenicke, posted on May 25, 2018 at 1:58 pm, filed under Leadership Bend.